A Swedish newspaper has used its front page to urge Britain to remain in the European Union, following similar splashes on titles in Germany and the Netherlands. 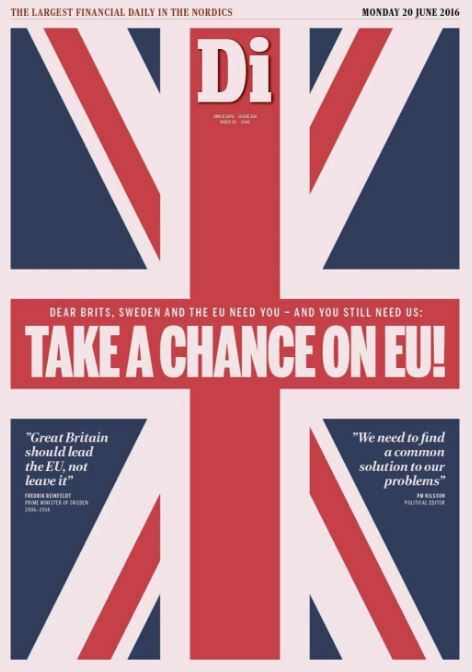 Financial daily Dagens Industri covered the front page of today’s edition in a Union Jack and channelled pop group Abba with the headline “Take a Chance on EU”. The paper’s political editor Peter Magnus Nilsson has written an online blog in English titled “Dear Brits!” where he has listed all the things he believes Sweden and the UK have in common. He writes: “We share the same rainy low pressure trajectory from the North Atlantic, the same longing for Gran Canaria, have the same good popular cultural taste in music, we understand the importance of free markets, independent companies, free routes, a strong navy and that meetings should start on time. He added: “We are all like you – proud and headstrong with special relationships to each other. And we have a club. Don’t leave it”. 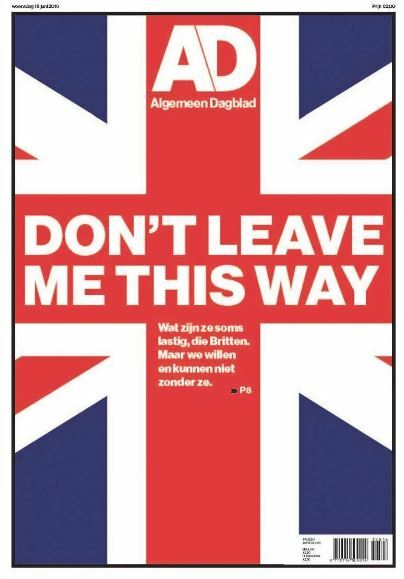 Dutch newspaper Algemeen Dagblad suggested the EU without the UK would be like “tea without milk” last week as it featured an adapted Union flag on its front page alongside the headline “Don’t leave me this way”, the day after The Sun backed the Leave campaign. 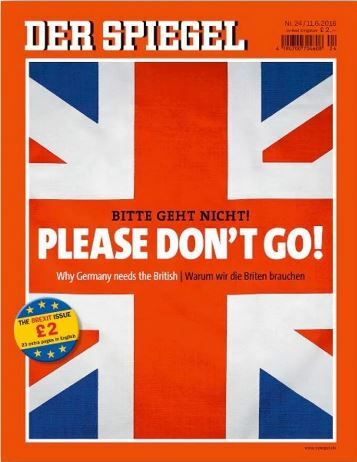 It followed German political weekly Der Spiegel’s front page telling Britain “Please Don’t Go!” earlier this month. In an online article The news magazine said Brexit “would be a catastrophe for everyone, including the UK itself” back-dropped by a image of Boris Johnson in a tug of war. A leader column inside Algemeen Dagblad read: “Hello Britain, this is your neighbour calling. Please don’t leave us. “Of course there will always be a Great Britain, anchored only 20 miles from the continent. England, Scotland, Wales and Northern Ireland, we feel at east in your amazing country. “Since our King William III (of Orange) married your Queen Mary II (of England) we have been related anyway. “Nobody in Europe appreciates your culture more than we do. The Beatles, Bridget Jones, One Direction, EastEnders, Brideshead Revisited, we love it all. Many of us know Monty Python’s Dead Parrot sketch by heart. “We admire your stiff upper lip. And every year we remember, with the greatest respect, all those who have fallen to liberate our country. “Now you are thinking of leaving us. Sailing out your floating country towards distant shores, so says your largest newspaper, The Sun. “Talking as a Dutch uncle, we have to tell you this is not a good idea. We not only love you, we need you. Who else supports us in keeping some common sense on this turbulent continent of ours? “An EU without the UK would be like tea without milk. Bitter. So please, stay. Stay with us. The UK goes to the polls on Thursday to vote on whether Britain should remain or leave the European Union.